By the looks of the most recent nationwide polling, the Republicans may well have the makings of a new guard to choose from to take on the Democrats in 2016. And it is shaping up to be a relatively young field of candidates, especially when compared to the most talked about likely Democratic nominees. But while the Republicans may have the new faces to appeal to a younger, broader slice of the electorate, they remain divided on how, and if the GOP should change itself to be more competitive in the future. Nonetheless, it is ironic that the GOP, which has lost the youth vote in the last three presidential elections by double digits, has a younger potential field of candidates than the Democrats, who have carried Millennials and GenXers in the last three elections. Current Republican national leadership includes Rep. Paul Ryan (age 43) with a 65% favorable rating among Republicans and Independents who lean Republican according to a recent Pew Research Center survey. 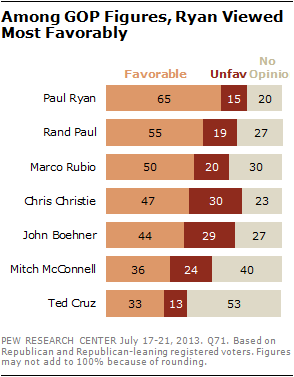 Not far behind Ryan is Sen. Rand Paul (age 50) who has a 55% favorable rating. He is closely followed by 42-year-old Sen. Marco Rubio with a 50% favorable rating. Gov. Chris Christie at age 50 gets a 47% favorable rating from the GOP faithful. In contrast, the Republican party’s older establishment leadership: House Speaker John Boehner (age 63) and Senate Minority Leader Mitch McConnell (71) get markedly lower ratings. The youngest Republican, Sen. Ted Cruz (age 40), is still not well known by most Republicans nationally. On the Democratic side, an older generation dominates the field and it is much more popular with its own rank and file. First and foremost, Hillary Clinton (age 63) achieved a near universal favorable rating (88%) among Democrats and independents who lean Democrat in a December poll, while 70-year-old VP Biden’s favorable rating among Democrats and leaners a month later was not too shabby either (72%). While the Republican party now appears to have fresh faces who might lead them out of the woods, the GOP is conflicted about its future. On the one hand, most Republicans (67%) say the party needs to address major problems to do better in future elections, and 59% believe some of its policy positions should be reconsidered. But when questioned further, it is clear that there are deep divisions among Republicans with respect to these new directions. Indeed, on many issues, Republicans continue to subscribe to positions that might well keep young voters away, new leadership notwithstanding. For example, on abortion and gay marriage, about as many Republicans want the party to support a more conservative stance rather than move in a more moderate direction. 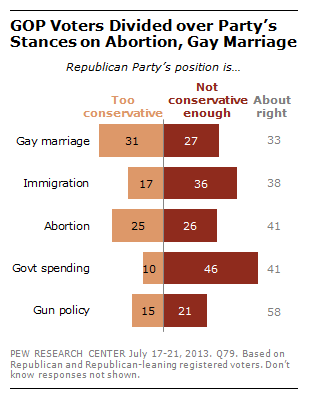 On immigration, most Republicans tilt toward taking a more conservative approach. Among five issues tested, on only one – gun policy – do a majority of Republican voters say the party’s position is about right. But other polls show the Republicans remain pretty far away from the general electorate on gun policy. The Democrats, with potentially a very strong candidate, certainly appear to be on much safer ground. They should be able to hold together their party’s younger coalition, notwithstanding its older field. However, one risk looms for Hillary Clinton or Joe Biden: A major decline in approval of Obama’s leadership over the course of the next three years is a clear Achilles heel. Deep discontent with the president would likely lead voters to look for change. With decades of experience and close ties to the administration, neither Clinton nor Biden would fit the bill of a breath of fresh air.